These foxtails beckoned in the breeze, inviting me to stop and admire their varied hues and graceful dance. 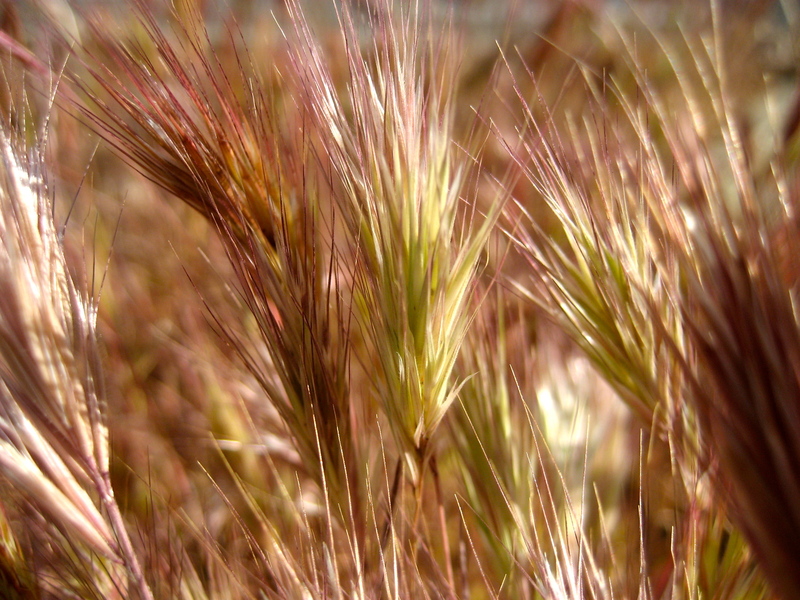 Stunning to look at, the foxtails (Hordeum jubatum or Foxtail Barley) are very single minded in their purpose and design. Their spikelet clusters are made to spread the plant’s seed via animal traffic. When wild animals move through the plants the foxtails cling to their animal hosts’ short coat and later disperse in a different location as the animal travels. Pretty nice ride! But foxtails are on the naughty list for pet owners because of their tendency to burrow into the longer coats of dogs, and even into the soft tissues of the nose, ear & mouth, causing infections. Not too poetic, but then, what’s a weed to do? Only its job. Ooh, lovely! I like the textures and the soft red and green of these. Thank you Sarah! I couldn’t believe the colors when I saw them. It was truly captivating.